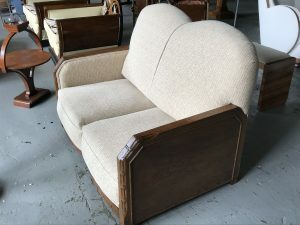 Original art deco two seat sofa with oak trim and sides. A lovely original art deco 2 seat sofa with oak sides and front trim, a very nice piece in good condition. For more details please call 01257 473688. 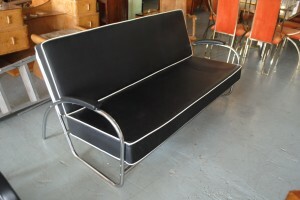 A stylish, black and chrome sofa with white contrast piping, in great condition. 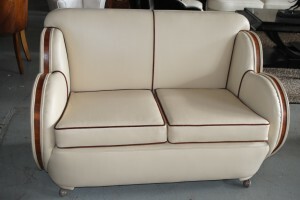 Very rare original art deco Epstein 2 seat cloudback sofa with walnut trim. Fantastic piece! We are delighted to have acquired this very rare original art deco Epstein 2 seat cloudback sofa in excellent condition with lovely walnut trim, cream leather and contrast piping. For more details please call 01257 473688. 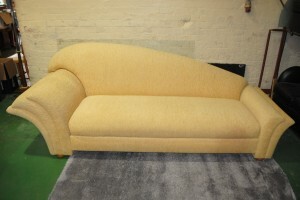 Stunning chaise lounge in excellent condition having been upholstered in cream fabric. Beautiful shape and design both front and back. You will need a large space for this piece as its 9′ long but in the correct setting it will be amazing. We have taken this in part exchange on another suite. 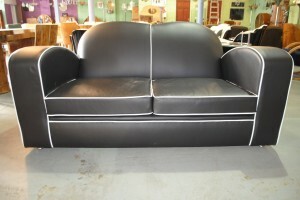 Newly upholstered in black leather and white piping and in excellent condition. 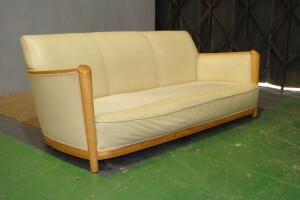 A fabulous original Maurice Adams art deco 3 seat sofa with fantastic shape and just waiting to be re-upholstered. This is a classic Maurice Adams sleek design and has been finished in lovely birdseye maple veneers.